Recumbent bikology in the urban jungle. : How much capacity required when touring light? "Would you like four panniers or two?" A customer -- who rides a sky blue Volae Century ES -- named Wylie (see her excellent blog Couch Surfing Cook) sent me a link to a nice site about long distance touring: www.skalatitude.com. This blog, written by a female cyclist touring solo, contains tips and ideas that apply to anyone, male and female alike, who wishes to bicycle far. She specifically directed me to an entry about lightweight cycle touring with only two panniers, a minimal amount of carrying capacity. It challenges the notion that long haul cycle tourists need the capacity provided by four panniers. This is a welcome and interesting voice in the discussion around ultra-light packing as we continually seek knowledge on how to travel "better." (I define "better" as "safer, more fun and more expeditious," just so you know where I stand.) Is it better to pack minimally and light? Is it better to pack for comfort and security? How do we pack and prepare for the most common and/or serious pitfalls? Do we carry a water filter or iodine? What goes into our first aid kit? Synthetic or down jacket? Tent or tarp? Shoes or sandals? Each of us determines our own comfort zone in the continuum. Before I get into a discussion about bag capacity, I'll make clear my position on the subject of packing for preparedness: I pack for safety above all else because if I don't arrive safely, I don't arrive. Secondly I pack to have fun, because that's why I do trips. Thirdly, I pack only the essentials that I'll need to get where I'm going. I carry tools to repair every element of my bike. I carry water purification and a stove when I'm in remote areas. I always have backup lights and batteries. I carry a first aid kit that is larger than my Western Mountaineering sleeping bag and I know how to use it thanks to Wilderness First Responder training. And, fortunately, at this time, I'm healthy and strong enough that while I do count pounds, I rarely count ounces; bike weight is of minor concern. Going forward now, I'd like to delve into a specific aspect of the article, concerning the writer's two-pannier baggage carrying system, and translate it for short wheelbase recumbent bikes. Sometimes the wisdom about bike touring needs to be translated over to the recumbent frame. How much capacity do we need and where do we mount it? Optimal bike handling (a.k.a., safe bike handling) is retained by loading the weight near the center or gravity and low to the ground. So, on a standard frame ("SF") bike, generally people load a bike in this order: 1. frame packs (water bottle cages, seat bottom, center triangle); 2. top of the rear rack; 3. handlebars; 4. large panniers on the rear rack; and 5. small size panniers on the front fork, if necessary. All the while, one seeks to keep the weight low (food, water, tools go at bottom of rear and front bags). Unlike bents, SF bikes lack the option of mounting low rider packs in the center of the bike. 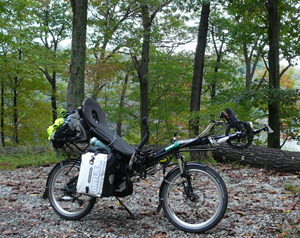 On a short wheelbase ("SWB") recumbent, optimal handling is retained by loading as follows: 1. low on the back of the seat (at the center of gravity); 2. frame packs; 3. small panniers under the seat; 4. large panniers on the rear rack; 5. rack top; and 6. high on the back of the seat. As on a standard frame bike, a bent handles best if you place heavy items as low as possible. Unlike SF bikes, SWB bents rarely accept panniers on the front fork. As for traditional handlebar bags, they are generally unmountable and all the bent-specific versions I've seen are minuscule. (If you know of an exception to this, send me the link [rmatson AT theinnovationworks DOT com].) I suggest loading bents in this sequence because one's upper body weight is not available (as it is on a SF) to comfortably counter-balance a lopsided load (e.g., top heavy or side-weighted). Also, an improperly loaded bent may tip at low speeds or in slow sharp turns, and no longer track easily when guided by hand, as when walking through a train station or up a steep hill. In terms of carrying capacity, a challenge for SWB riders is that large size "rear" panniers -- usually the first panniers we'd load on a standard frame bike -- will scrape the ground on steeply angled turns when mounted under the seat, in a bent's first loading zone. So, the first bags we load are small capacity panniers under the seat. What I find is that those are quickly filled and, even for just a weekend tour, I soon need another bag on the rear rack, whether it's a rack-top bag or a rear pannier (or two). As a result, even on short trips, it is not unusual for me to use a four- or five-bag setup, but with half-full bags! My objective is to properly distribute the weight so the bent handles well. Optimal handling translates directly into safer riding which, since safety is my first priority during a trip, is paramount to any other consideration, including whether a half-full bag adds wind resistance or an unnecessary pound of weight. What is interesting is that a good bent, properly loaded, will handle almost identically to how it handles without any load and it is precisely this quality that makes a (good) bent a welcome traveling companion. Here's a photo of my bag setup for a two-day bike camping trip in rainy weather but moderate temperatures (50-70 F day, 40-50 F at night). It shows two small underseat Ortlieb bags plus a rear rack bag with bungee net to hold rain gear. On the frame I've mounted a bike lock (since half the trip was in urban areas), odometer, map and pepper spray. I carry a water bladder, the day's food and extra warm layers in the rear rack-top bag which is an Ortlieb recumbent backpack. HP Velotechnik Grasshopper fx loaded for an apx. 160-mile weekend trip, from Brooklyn, NY, to Harriman State Park and around about and back. Here's a photo of your humble servant looking "high-vizible" and slightly unshorn. New York City Recumbent Supply owner Robert Matson. As for analyzing what to pack and how to lighten the load, I will hold off for now but will continue to post articles on that subject as I find or write them. [The same] Solo Female cycling with "only two panniers." Includes her gear list. I like the way she picks up and adapts gear that she finds along the road. David publishes his gear list from two round-world trips. Both gear lists are streamlined and small. Him and his wife Julie have some nice photos too.